More commonly known as Flavonoids or Bioflavonoids, Vitamin P is a water soluble vitamin. It has a crystalline structure and yet it takes on the characteristics of a Bioflavonoid. In the case of Vitamin P, its main function is to keep blood vessels healthy. One way it accomplishes this task is by building up a capillary's ability to resist bleeding profusely. This helps keep capillaries strong and a stronger blood vessel system is better able to protect itself from disease and infection. 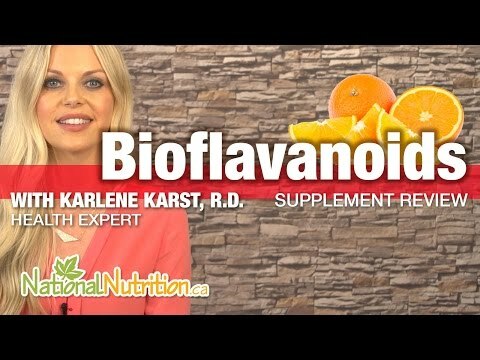 In the case of Bioflavonoids, a significant benefit is their antioxidant capabilities. Antioxidants prevent many serious diseases from developing by neutralizing free radicals. If not neutralized, free radicals can cause substantial cell damage. Oxidation is what happens to the part of a car that develops rust. In much the same way as rust begins to destroy a car's body, free radicals begin destroying cells. As cells begin to break down, the body becomes susceptible to heart and other types of diseases and other adverse conditions including premature aging. Another important quality of Bioflavonoids is their effectiveness as an anti-inflammatory. It's possible that consuming Bioflavonoids benefits muscle and joints by helping bruises in these areas heal faster. Because of its ability to relax the muscles in the cardiovascular system, there is a possibility that Vitamin P may play a role in lowering blood pressure. Some other areas being researched are Vitamin P's ability to interfere with growing tumors, and how it impacts other types of bleeding such as nosebleeds, hemorrhoids and bleeding in the retina (a problem for people with hypertension or diabetes). Bioflavonoids are plant-based so they are found mainly in fruits and vegetables. Specifically, the brightly colored fruits and vegetables in shades of red, orange and yellow are the best sources. Mangoes, apricots, oranges, grapefruit and other citrus fruits, lemons, cherries, blackcurrants, plums, and grapes are good fruit sources. Carrots, tomatoes, green peppers, broccoli and onions are good vegetable sources. Believe it or not, much of the bioflavonoid value actually comes from the rind. Red wine also is a good source of Bioflavonoids and even medical professionals recommend drinking a glass with dinner. Buckwheat, ginkgo, green tea, milk thistle, hawthorn, rose hip and yarrow all contain Bioflavonoids, as well. There isn't a recommended daily allowance for Vitamin P. What is recommended is to get at least 5 servings of fruits and vegetables every day. Choosing those which are brightly-colored will provide the most bioflavonoid benefit. People who make eating fruits and vegetables a part of their diets will automatically get sufficient quantities of Vitamin P. Adding a glass of green tea for lunch and a glass of wine with dinner will allow the body to reap even more bioflavonoid benefit. Those who do not like these foods and beverages need to realize the importance of making them part of their daily routines. Just as there are no recommended daily requirements, there aren't any risks associated with a Vitamin P deficiency. It's not a toxic substance so there aren't any adverse side effects from consuming too much, either.